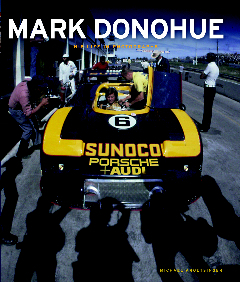 This book is a companion volume to Argetsinger’s excellent bio Mark Donohue: Technical Excellence at Speed. Publisher David Bull clearly has his fingers on the pulse of what readers want—and are able to afford. His books are not cheap but there hasn’t yet been a case of a David Bull book not being good value for money. Still, Bull’s desire was to keep the price of the Excellence book to under $40 and, since it runs to a hefty 250,000 words, the only way to achieve it was to cut back the number of photos. 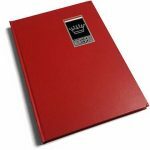 So, for the reader able and willing to plunk down another $39.95 the 40 photos in that book can be augmented with this companion volume by the same author containing almost 250 photos! 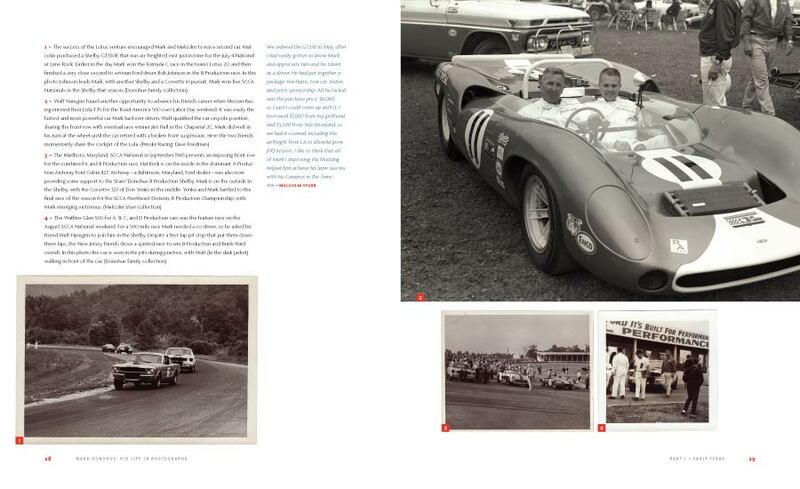 (And if that’s not enough you can buy it in a limited Publisher’s Edition of 300 copies that adds another 16 pages of photos and is also signed by the author and seven of Donohue’s closest Penske Racing associates: team manager Chuck Cantwell, engineer Don Cox, fabricator Ron Fournier, crew chief Karl Kainhofer, Sunoco engineer Jerry Kroninger, timekeeper Judy Stropus, and mechanic John Woodard. $99.95) Now you have the option to “pay as you go” rather than being forced to buy one expensive $80 book. 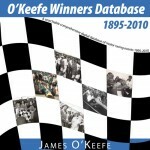 Being specifically a photo book, its format is enlarged to 9 x 11″. Argetsinger reviewed thousands of photos from professionals and civilians and selected those that best fit the arc of the story (told chronologically) and then had Donohue’s family and colleagues provide background and quotes for some of those photos. A complicated approach but the result is a highly customized, rich tapestry. Readers with an interest in bookmaking will find much to marvel at in this book. From the color of the headbands to the selection of complementary typefaces, styles and colors, designer Tom Morgan shows an admirably sure hand in balancing purpose with restraint. Each of the four parts has a short introduction and is then subdivided into chapters that consist solely of photos with very, very detailed captions that go far beyond merely describing the scene at hand. 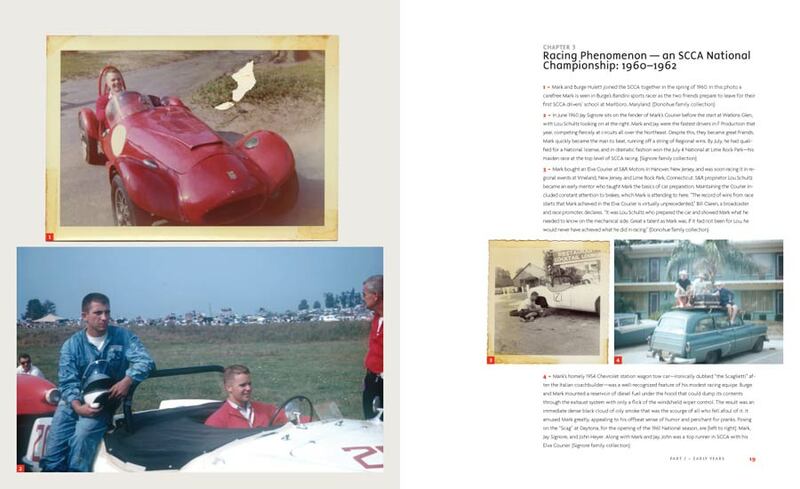 While the book is not intended to take the place of a proper biography, there is sufficient information here to give the proverbial bird’s eye view of the man and his times, from early childhood to his death at the 1975 Austrian GP. A biographer faces a multitude of choices as to how to portray his subject in a way that is truly representative and also free of the projections the biographer inevitably brings to the task. That Argetsinger, himself a racer and from a racing family, understands not only Donohue’s profession but the man himself is evident in this: If you knew nothing about Donohue and all you had is these photos from which to form an idea of the man, based on purely visual cues such as body language, facial impressions, mannerisms and the observable dynamic between protagonists, you would surmise that Donohue was quiet, pensive, deliberate, an observer, not grouchy, usually at ease. And you’d be right. Because he was (there’s a reason his nickname was “Captain Nice”)—and because Argetsinger got his portrait right. Donohue set new standards in his sport. In the era in which he raced, technical innovation far outpaced safety measures. It was 1974 when he said, “If I get wiped out and they carry me away, I wouldn’t expect anybody to feel sorry for me. It’s something I know is a possibility. I’m not complaining.” A year later it came to pass. Read the last sentence in the book, look at the last picture, and allow yourself to be moved.